Why Tolstoy Was Wrong about Happiness: A Review of Deep Sea Diver, SECRETS - Michael Minkoff, Jr.
Wistful and fierce, Deep Sea Diver’s SECRETS submits the strength of craft to the demands of feeling to yield an exquisitely well-balanced and self-controlled musical recollection of the (sometimes broken) promises of intimacy. I made a conscious decision to play more guitar on this record. I tried to take a step in the direction of having—I don’t know if “jarring” is the right word, but more in-your-face guitar tones. It was a little scary for me at first. It felt untamed. Even rehearsing—it has taken me a lot more time to be able to sing them and play those parts at the same time. On the first record, it felt very manageable and safe. This one isn’t. From the first opening notes of taut distorted guitar on the polyrhythmic album opener “Notice Me,” it is apparent Dobson made good on her commitment. The track evidences much of what makes this record a rare ruby of craft. In production: irreproachable tone, texture, and space; a perfect balance of cohesion and articulation. 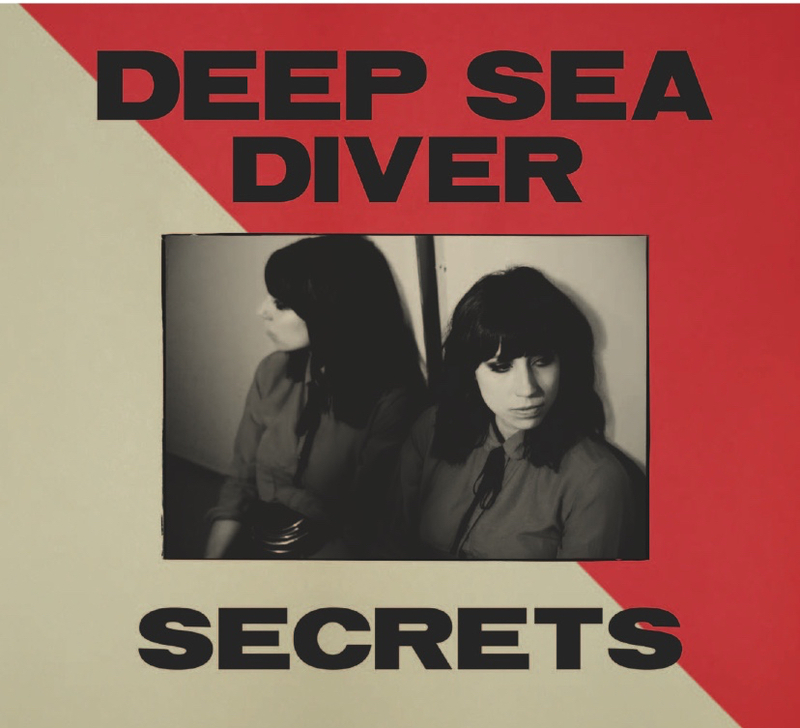 In composition and instrumentation: The songs on SECRETS rise into magnetic cohesion with precise violence and intentionality. Patient builds and exact pockets aurally mimic a controlled demolition played back in reverse. This record seems to adapt to my expectations while I listen—as miraculous, inevitable, and satisfying as a good magic trick. SECRETS is like a musical cataloguing of the protective dikes of loneliness we erect between the fleeting polders of our togetherness, at times skating on that loneliness to hold contradictory possibilities simultaneously in view. The emotional palette of this record is expansive, at once intensely personal and yet relatable—plaintive and elated, accusatory and introspective, wounded and vengeful, cold and passionate, playful and serious. My heart aches throughout this record, being stretched beyond its normal everyday uses (which I freely admit are generally mundane). A nostalgic bittersweetness colors the whole record, but this is no more pronounced than on “It Takes a Moment.” When Dobson sings, “I’m free!” into the dissonant swirl of a wavering synth, it’s impossible to deny the universal truth of that moment. We have all experienced the simultaneous pull of regret and relief. So many of the moments of this record play out the same way: the music, the vocals, the production, and the lyrics conspire perfectly to evoke and recollect moments and emotions that feel both alien and familiar. So what are the secrets the title promises? There’s a reason, I suspect, that the title is stylized in all-caps. Isn’t it the case that the best place to hide secrets is in capital neon letters by some well-traveled public road? Like a forgettable spam-designated email subject line, the best protection for our secret pains and regrets, “a gun with no trigger” pointed at a corpse, is for them to be released unprotected and unaltered into the noisy digital age. So the most interesting part of SECRETS is not in its revelations, but in its questions. Especially in our noisy digital age, how does sincerity get heard? How can you be yourself when all anyone ever talks about is “being yourself,” and no one actually knows what that means? How do you actually find true intimacy in a world that has so convinced itself of its own connectedness that it has prematurely torn out the old, and only sure, pathways to community? How do you fight for what you care about when sincerely caring is social suicide? How do you protect the patently perishable real things in this world from the violence of convenience that society refuses to let you decline? SECRETS raises these questions and probes wounds, some I didn’t even know I had. Then the last song, “A New Day,” leaves the record unresolved, with the speaker alone. In other words, SECRETS doesn’t purport to provide answers or any healing other than the catharsis of recollection. Instead, SECRETS complicates and humbly contradicts Tolstoy’s axiom about happy families: “All happy families are alike; each unhappy family is unhappy in its own way.” If we are honest with ourselves, we all want to agree with Tolstoy. We want to think that we all hurt in ways that no one else can understand—the heart knows its own bitterness, after all. But SECRETS proves that Tolstoy didn’t get it (all) right. We all feel the very same pain in rejection and loneliness. Ironically, we might be most together as a human race in the common pain we all share in being alone. Sure, no one knows your heart’s bitterness, but that’s because your bitterness mostly stems from being alone. And that feels the same for everyone, off in their own world. As Warbler’s Sean Sullivan opines on “Into the Mud”: “Great numbers make no community, and there’s loneliness in the middle of the city.” But that is where the virtually common feeling ends. So, in fact, Tolstoy is exactly wrong. SECRETS shows that we are most alike in our unhappy loneliness, but the path we each must take toward true intimacy is absolutely unique and personal. The heart may know its own bitterness, but no stranger shares its joy. Joy is so personal and unrepeatable, it is nearly impossible to recollect it honestly. And to share joy with another is the truly unspeakable secret. Dobson may have found it. But she’s not telling. And then there’s this. It didn’t really fit in the review, but it’s still interesting to me. Take it or leave it. If I were to be completely honest (and I don’t see why I shouldn’t be), most female vocals (unlike Dobson’s in every way) strike me as being unpleasantly affected and emotionally false. I used to blame the artists themselves for this, but I don’t so much anymore. I think that the great pressure we put on female artists to both distinguish themselves as uniquely valuable and also fit into our admittedly masculine aesthetic values (you can call them “marked” values if you want to get pedantic about it) has become an unfair burden on most female artists and a self-fulfilling prophecy. In each of those cases, the artists found themselves being compared to themselves—or at least they were being compared to the (incomplete/distorted) version of themselves that had been formulated by their promoters and audience. But they were nonetheless under the pressure of comparison. I can’t help but think that Arcade Fire wrote Reflektor as a self-reflexive commentary on their own face distorted in the mirror of public recognition. There is no doubt that Congratulations self-consciously set synthesized fire to the MGMT effigy fans formed after “Time to Pretend” went from fantasy to reality. Expectations and comparisons can become an enormous problem for artists when they internalize them—when they punish and restrict themselves on behalf of their potential critics. I think that’s what happened to Elliott Smith, who helped so many walk through the pain yet couldn’t ultimately do it himself. He lost the fight with his own false self-image. It still makes me cry to think about it. The point is that most artists don’t know how to deal with the pressure of being compared to themselves or others. It takes either great courage or sometimes a tragic despair to escape the pressures of external expectations which you have no power to alter or inform. The problem of comparison makes SECRETS all the more remarkable to me. It represents to me not just a professional achievement, but probably a personal victory as well. I cannot imagine how enormous the pressure of comparison would be for Jessica Dobson, but she seems to be navigating it effortlessly. Think about it. It would be daunting to work on your own personal project when you’ve been a touring musician for such “big names” as The Shins, The Yeah Yeah Yeahs, Connor Oberst, and Beck. You’d be constantly questioning your decisions. Even if you try not to be a copycat, just by comparing you are letting their shadows constrain you. And of course, as we’ve mentioned, being a female artist has its own set of comparisons. If I were Jessica Dobson, I would certainly be sick of being asked how it feels to be a female lead guitarist. Are you allowed to play “complicated, even intellectualized” music without it being pointed out by a reviewer like you’re some anomaly of the female species? Apparently Dobson scrapped two projects with Atlantic Records before she was able to release her first solo EP. She wasn’t personally satisfied with either. At the beginning, she performed under her own name. Now she performs under Deep Sea Diver. I don’t know how self-conscious that change was. But I sense a successful strategy in it. As far as I can tell, most of the songs in SECRETS revolve around broken relationships, but I don’t think the speaker is the current Dobson. The speaker of the songs is fictional, or at least synthetic. How strange: by denying her name, Dobson fully possesses it. By speaking in fiction, Dobson is free to tell the truth. And tell it, she does. Such a great review. Thanks for this, Michael.